Returning from the Ellora caves, as the car navigated the twists and turns over the mountains, the ramparts of the fort came into view every now and then. A stretch of plain land surrounded by mountains, a perfectly conical hill in the centre, surmounted by a fort, a white structure gleaming in the sun, a tall tower at the foothills rendering the scene perfect, its bright red colour a stark contrast to the brown that enveloped the fort. The Daulatabad fort was an inviting sight, even from a distance. However, it wasn’t the fort itself, but its story, that drew me to the place, which made me insist on a quick visit, in spite of the short time we had on hand. The history of Daulatabad goes back to the sixth century AD, around the time the Ajanta Caves were built, as seen from the remnants of ancient Buddhist settlements nearby. The village was then known as Devagiri – hill of the Gods, and was an important town on the caravan route. With time, the town grew in importance till it ultimately became the capital of the Yadavas when they broke away from the Chalukya rule in 1187. The fort remained in the hands of the Yadava dynasty for more than a century, till the arrival of Allaudin Khilji in 1296. Khilji captured the fort, but left it in the hands of the Yadavas as his vassals. However, the city was attacked again by Malik Kafur in the early 1300s and the last of the Yadavas were slain. The city and fort then drew the attention of Muhammad-bin-Tughluq who had succeeded Alaudin Khilji in Delhi. Tughluq was so impressed by the impregnable fort and its riches that he renamed it Daulatabad – the city of wealth, the name it carries till today. Tughluq was so enamoured of his new acquisition that he ordered the capital to be shifted from Delhi to Daulatabad. Apparently, he didn't just want the administration shifted. He wanted the entire city to be moved! On his orders, every man, woman and child were to pack their bags and set off to reside in the new city. And therein lies the origin of the phrase – ‘Tughlaqui Farman’. Literally, that translates into ‘Tughlaq’s order’, but what it means is ‘an absurd order’. And yes, the term is justified, because, even before the capital had shifted completely, Tughluq had realised how unfeasible it was, and he reversed his original order, forcing people to move back all the way again! I wonder how many actually moved back, or if some of the population in the vicinity of Aurangabad and Daulatabad has its roots in a few families who refused to follow their eccentric ruler! 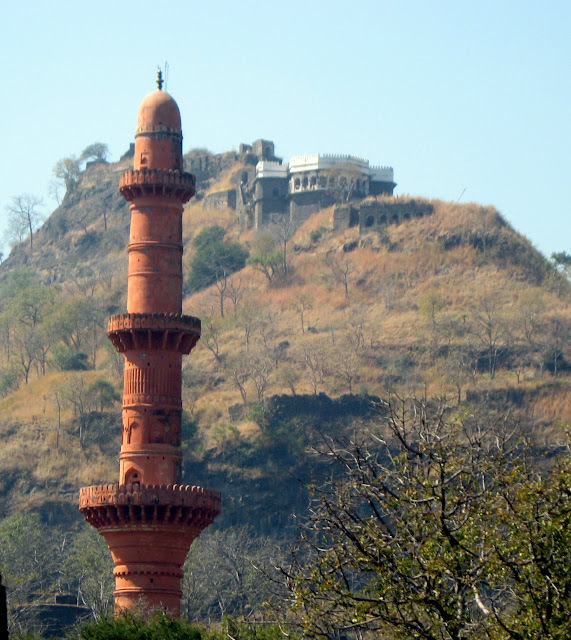 The passing of Tughluq did not bring peace to Daulatabad. In 1347, the Bahamani Sultans captured the fort and held on to it for another century. It passed to the Nizam Shahis of Ahmednagar in 1499, who made the city their capital in1607. The fort was at the centre of many skirmishes with the Mughals until Shahjahan eventually captured the fort in 1633. Aurangzeb used the fort as his headquarters for his conquest of Bijapur and Golconda, but the fort itself continued to face attack from the Marathas. The city passed into Maratha hands for a brief period, but was soon recaptured by the Mughals. With the decline of the Mughal Empire, the fort next passed to the Peshwas, but they could not hold on to it for long either. The fort was eventually captured by the Nizams of Hyderabad in 1724 AD, and they held on to it till Independence. The fort has witnessed so many wars that the scars are apparent. Most of it lies in ruins, with only vestiges of its once-strong fortifications still standing, but even they inspire such awe in us that we can only imagine what the fort would have been like, at the height of its glory. That is long enough for a history lesson on Daulatabad. I had initially planned to mention it in passing, but it seems to have a life of its own, and grew completely out of control till I hadn’t the heart to cut it short.... Look out for Part 2 for a photo tour of the fort! Anu,thanks for reminding the story of Tughluq. Have studied that in school days. Hope you enjoyed your trip . I like the place very much. Nice insight on history! Thanks for sharing. Nice narration about the history of the fort. Looking forward to the next detailed post about it.